There are holes in our hearts. Literally for Nash and figuratively for us. Last month, Nash was diagnosed with Patent Ductus Arteriosis (PDA), a condition in which a blood vessel called the ductus arteriosus failed to close after birth. Basically, the channel between the aorta and pulmary artery never closed in Nash's heart. 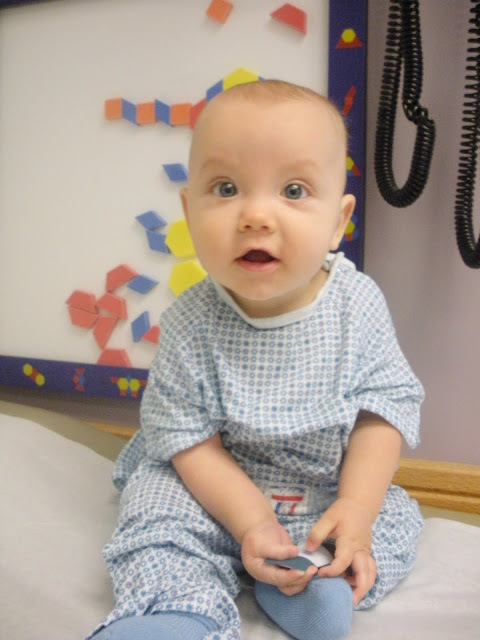 His pediatrician noticed a prominent heart murmur at his six month check up and referred us to a cardiologist. The cardiologist immediately detected the PDA in Nash's echocardiogram as the cause of his heart murmur. Before birth, the two major heart arteries are connected by the ductus arteriosus. This vessel is open and is an essential part of fetal blood circulation. Within minutes or up to a few days after birth, the vessel is supposed to close as part of the normal changes occurring in the baby's circulation. In rare cases, however, the ductus arteriosus remains open (patent). PDA occurs more often in pre-term infants than in full-term infants. It occurs on average in about 2 of every 1,000 full-term infant births. PDA is also twice as common in girls as it is in boys. Since Nash was considered full-term and is also male, the odds were really against him for being diagnosed with PDA. The doctors were puzzled at the detection, especially since no one noticed a heart murmur until Nash was six months old. If PDA is left untreated, it can cause too much blood to flow through the heart, weakening the heart muscle and causing heart failure and other complications. It can also lead to an increased risk for bacterial heart infections. People with PDA usually develop heart problems sooner or later unless the PDA is closed. So, we are opting to repair Nash's PDA by closing the open channel with a inserted coil. He will undergo cardiac catheterization for the procedure. Nash underwent his first surgery before the age of one yesterday and will have another surgery to repair the PDA in a few months. 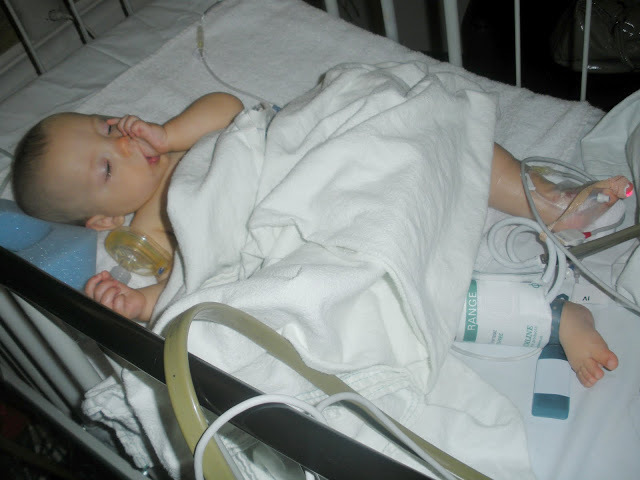 The nurses, doctors, and anesthesiologists all pointed out how loud his murmur was while examining him pre-surgery. A nurse practitioner even let me listen to the irregular beat. May I just point out amidst the surgery situation how adorable little baby gowns are? Those ties in the back? Too precious for words. It felt like my heart had holes in it when I had to hand over our sweet baby to the anesthesiologist. I teared up as I watched her carry Nash down the hall into a room that only people with green scrubs could go into. It was also hard to see his helpless little body on a hospital bed in recovery. He was completely out of it. Nash did really well with his first surgery, but the poor little guy hasn't been himself since the procedure. With any surgery that the patient is knocked out and given narcotics, there is a lot of sleepiness and pain that follow. It is amazing to me how many millions of things can go wrong in the development of a child. And how perfect babies can be born with no threatening medical conditions whatsoever. We are so grateful that in Nash's case, his ailments have been somewhat minor and have not affected his growth and development. We love our little Nash and we are confident that he will endure these procedures with strength and resilience. We are also so grateful for the concerns and prayers that have been sent our way. Thank you! Reading this put a little hole in my heart too, but I am SO glad that he's going to be ok. The first part that you wrote really scared me. I actually got a sick feeling in my stomach for a minute and then I skipped everything else to scroll to the end and see if Nashy #2 was going to be ok. Thank goodness he is. I wish I could give you (and him!) a hug right now! Poor baby Nash!! That has to be so hard for you!! I can't imagine. I'll be keeping you, Nash, and your family in my prayers. ugh! they thought leah had this at birth. actually, i think she did. she was in the nicu anyway, but it closed by itself after a few days. so scary! i hope the surgery went well. i so feel your pain about sending off your little one under anesthesia. yuck. he sure is a cutie. I had no idea you guys were going through this. If there is anything I or Lincoln can do for you guys please let us know. I have to say as well that Nash looks like a little doll. We will be thinking of you guys. We are so out of touch since your mom and dad moved. What a sweet little angel. All will be well, keep us posted. We'll be thinking about you! Oh goodness - those pictures of him are so adorable and then the last one was so sad! But thanks heaven it's a fix doctors know how to do and that Nash is doing ok. Poor baby and mama! I hope there are only improvements from here on! So sorry that you guys are all going through this. Watching and knowing your child has some type of complication (whether it causes pain or not) is so tough on parents. I am glad Nash is having everything done now instead of later, not just cause of possible complications or illness, but since he is a baby he will have no memory of the whole thing and since children can be so resilient I am sure he will bounce back and continue to be that cute little Nash (I agree with how cute the gowns are)!! So sorry to hear that! It makes me so grateful for modern medicine and skilled doctors who can put us back together. We will keep you in our prayers, please let us know if there is anything else we can do for you! Hope he heals up quickly, he is so cute! Thank you for the explanation. I'm so sorry but so glad that they detected it and you can get it all fixed up. And yes he is so totally darling in his hospital gown. What a sweetie. I hope he has a speedy recovery and will be back to your normal little boy very soon! How did I not know about this?? I agree, he is adorable in his little hospital gown!! I'm glad everything went well. We will keep him in our prayers.